Twelve years ago, one of the most controversial vehicles we’ve ever seen was born – the Pontiac Aztek. Some call it the ugliest thing they’ve ever seen, while we have a different opinion on the matter. Not only is it spacious; it had durable plastic everywhere, decent fuel economy, and spaceship design elements to it. 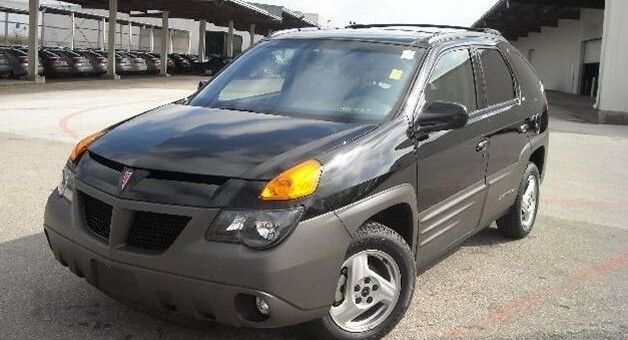 In short, the Pontiac Aztek was simply ahead of its time, as it was GM’s early take at a crossover SUV. Now that the Aztek has become some sort of automotive icon (perhaps with the help of the hit TV show Breaking Bad), the popularity has risen – however, this VIN #001 Aztek remains an exception to the rest of them when it comes to book value. Back in ’09, this car went across the block at Barrett-Jackson, and sold for a healthy $15,950. Now this very model is for sale online at a dealer in Texas for a slightly unrealistic $16,999, although it has a mere 8,000 miles on the odometer. Rick what can I say other that you are full of donkey poo. The juke is uglier. Rick you should sell any GM you have and buy jukes. Everyone I sold a Aztec to loved the vehicle. I had one family buy one and a couple of weeks later bought another. Hey bubba if that vehicle is so bad, why did the Buick version sell volumes? And now that vehicle is hot on the used car market?? Great platform, great suv/cuv. Because the Rendezvous looked better; no contest. It wasn’t really the platform, it was the packaging. I hated this thing when new. To put it mildly it was a turd. As a GM ideologue it embarrassed me. But if it launched today from Scion or Subaru it would be proclaimed as the second coming. Proof once again that my sensibilities are the antithesis of trend setting. It’s as ugly today as it was back then. What were they thinking? Paul sell you GM vehicles. I’m a diehard GM fan but I still know ugly when I see it. Reminds me of the old joke: “What do you call 3 Aztecs on a dealer’s lot? I can remember seeing the prototype in Detroit. As soon as I got home I e mailed GM and asked them what the hell are you thinking If you even have any inkling of putting this into production. Note no reply. This is not the reason for the failure of Pontiac but it was the second to last nail in the coffin. The final nail was the loss of the Trans am leaving a Performance division with no real performance till Lutz was able to rush the GTO here with nearly no funds to do it. Pontiac began to die in the late 70’s and it was a slow long decline. There were flashes of hope but too many watered down and non performance models that clouded a line up that was clear that those in charge did not fully understand what Pontiac was or should be. The engineers knew and were the ones who crossed lines and these cars are the ones that pop out but they were too few and too underfunded. Look at the Fiero as it could have been something and the engineer broke a lot of rules to get it done only to have it underfunded and underdeveloped till it was too late. We looked at one of these when the wife’s car was failing a Mercury I inherited with marriage. We had just bought a house and I just started a new job and she was going back for a masters. Well money was tight and for the same price of a Sunfire we could get one of these at $10,000 off sticker new with AWD. We needed a car bad but we passes on it. It was not a bad car but we could just not get passed the looks. Someone should buy this and set it on fire. I hate how everyone wants Pontiac to be a FULL-ON performance brand. I don’t think that there is anything wrong with an I4 engine here and there (Just not the 2.4L I4). They could even add an ECO Hybrid trim to each model. With a 2.5L Twin Turbo I4 with 327 HP. Plug In and 2-Mode technology. Now when I say comparable I don’t mean literally rebadging the cars, GM should take those comparable designs and even redesign those specifically for Pontiac, (kind’ve what GM did with the Equinox and Terrain. Acadia, Traverse, Enclave and so on). All V8′s and V6′s have displacement on demand (V8′s shut off 4 cylinders while V6′s shut off 2). ECO buttons available with every 6 speed auto transmission. What’s your opinion of Pontiac based on this? What models do you see unnecessary? Would you buy a Pontiac listed here? You just pointed out the issue as a Pontiac with no performance is just another Chevy with cladding and red dash lights and a beak on the nose. Even the performance ones in later years were nothing more than Chevy had and even less in some cases where the G6 was not offered with a Turbo. I do not miss Pontiac for what they were but I do miss them for what they could have been. Pontiac started to lose their soul when they lost their V8 in 1979. Many Poncho fans have felt this way for years. I never understood this till much later on and I can see why they think that way as the engine is what really made the biggest difference in their cars along with their performance suspension. As of today I understand why they are not around and understand it would be very difficult to bring them back properly as to do it otherwise would be just a repeat of the last 25-30 years. GM has so much investment needed in what they have they need to get the division they have fixed and then worry about these other issues if they are still needed. I expect that they will be addressed in the division they have left well enough. Case in point to build a Trans Am bases on the Camaro would cannibalize sales from the one. increase development cost and increase marketing cost for minimal gain in sales. The Camaro with out the TA has sold about what the two of them would have sold if both were offered like in the past. Many said GM would lose market share and sales by killing Pontiac but it has not happened. If anything because they have taken the money and invested in better cars people are coming back. I wish there was a Pontiac but there just is not a need or enough profit there to add another division with cars base on Chevys. The very best we expect? Chevrolet makes a good effort with the Holden Commodore based “SS” sedan. A wagon “Nomad” and a ute “El Camino” make true possibilities as those body styles exist and would require only minor appearance changes and a few badges here and there. This was basically Bob Lutz’ plans just as the plug was pulled by GM on Pontiac. The G8 sedan plan included the Sport Wagon and Sport Ute – both models were penciled for production. In both standard G8 form and GXP form. Oh well. I traded my Grand Prix GXP, after 6 virtually trouble free years for a new Cadillac ATS Performance Edition 3.6 without regrets. A good friend immediately bought the GXP and continues the thrill for both of us. I love my ATS and never a day goes by without someone admiring it. I’ll upgrade to a performance exhaust system when a proper system becomes available (hello Borla). In the September issue of “Motor Trend” – a full on comparison of AWD models by Audi-BMW-Cadillac (ATS4)-Lexus-Volvo highlights the immediate need for upgrade to 8 speeds in the ATS with 3.6. And I agree. I personally do not care for the 6 speed – odd gear ratio choices for 1st, 2nd make no sense. Apparently the identifical issue exists with the 6 speed manual/2.0T combination. Takes 3 shifts before getting to 60MPH. ? explain that to me. Hopefully, the 8 speed will be part of the ATS-V package and will, ultimately, makes it’s way behind the 3.6 and the 2.0T versions. Another upgrade for 2014 in the ATS is the availability of 19″ wheels. They seem stuck with the Michelin Primacy ZP’s for some reason. Not the best choice at all. The Pilot Super Sport summer tire and the new Pilot Sport A/S3 make more sense. I don’t have flat tire problems and feel no need for the ZP’s and replaced them with the Pilot Super Sport summer tire almost immediately. Much nicer ride and handling. Evan, you need to let go. Pontiac is gone and GM is not going to waste $16 billion on a brand stained with the lie of “affordable performance”. Why is the G3, Spark clone, and appropriate powertrains for those cars missing from your list? Directly from the latter stages of Pontiac’s “if we have any left over cladding, I’ve got a place for it” styling fad. GAWD that was a bad era! In addition: “it had durable plastic everywhere”, ya and GM chose to use that same, cheap durable plastic on the first production Chevrolet Avalanche. I used to cringe every time I saw either the “Tupperware-wannabe” Avalanche or the “I really wish I was an AMC Pacer” Aztek. The sport recreational vehicle idea was cool (attachable tent option, especially cool), but executed in a poor manner. IMO, the concept Aztek wasn’t nearly as bad looking as the production version. Built on a shortened minivan platform, the oddly proportioned Aztek had a cousin named Rendezvous. Sorry Buick, I love you but the Rendezvous was just bad too. CLICK ON THE LINK in the article to see pics of the vehicle…Only about 10 inches between the top of the wheelwell and the top of the rear tire. The Aztec was reuss’s baby. Rendezvous was a very decent vehicle for its time. Yes but that was before Lutz and he taught him to grow a pair. Back then Mark answered to others and did what he was told. He did not come into his own for 10 more years. That was how the old GM thinking worked as if you questioned or took a stand you often paid for I by those over you that told you what to do no matter how wrong they were. This vehicle was a product of the GM system and its failings back them. That is the culture Lutz changed. There was many inside GM against this but they were all afraid to speak out. Does it still run? Does it come with an oil drip pan? Some ‘stoopid GM exec must have intervened and got this frankencrossover to production- there is NO WAY it cliniced well. I have directed auto research clinics and I’ve never seen an ugly car not get called out. The Aztek symbolizes all that was wrong with GM. Gave you an pos here as you are not far from the truth. Many on GM’s staff was against this car and were overruled buy the merchandisers they had brought in from the outside. There were many against it but none were high enough or empowered enough to fix it or stop it. This is the Culture they have been working so hard to change and the new cars are showing it. There are many examples from the 70’s through 2008 on how GM was in trouble or showed where they were failing to connect or properly fund things. The trouble was on many levels and there were many barriers that prevented them from correcting these mistakes. Today that has changed and is still changing. The Cruze was pushed through by Lutz to have more and better content than the other cars. Many complained and said they should cut back and they should cheapen them up. They cried it would never sell or connect with people. Well that was proven wrong and it has done very well and is still doing very well. Yet even today there are some of the old school in GM that are still calling for cuts in quality on the car but those in charge are refusing to give. I really recommend reading Car Guys VS Bean Counters as it is a clear example after example of issues faced at GM. If you read it you also note many present GM people helped with the book as if they were stating publically what was going on and to support the change they are working on. From what I have heard it was and has been a war internally with some. Also read On a Clear Day You Can See GM by John Delorean. It is a similar book at showing how GM was starting to fail internally even in the 60’s and 70’s. Reading these books by true insiders will really teach those who do not know the truth on what all that has been going on and these books only cover some of it. Amen to this, thanks for telling it like it is. inside medical, business and educational fields. sentiments, experience, feelings and in many cases innermost mindsets. hip kids clothes and trendy baby clothes. A lot of times it’s very hard to get that “perfect balance” between superb usability and appearance. I must say you have done a awesome job with this. Additionally, the blog loads very fast for me on Safari. Superb Blog! The clarity in your submit is just excellent and that i can assume you’re an expert on this subject. Fine with your permission allow me to grab your feed to stay updated with imminent post. Thank you one million and please carry on the enjoyable work. to shoot you an e-mail. I’ve got some suggestions for your blog you might be interested in hearing. Either way, great website and I look forward to seeing it expand over time. It is truly a nice and helpful piece of info. I’m satisfied that you just shared this useful info with us. Please stay us informed like this. Thanks for sharing. Hey now, This is a great car! Why don’t you bid on it or if you have a question give me a call here at Bonham Chrysler. Ask for George Hiatt 903-583-8877 or toll free 1-866-292-8410.